How do I add users to my account and restrict what they can see and do within my account? To add new users to your account and allow them various levels of access within your account, start by selecting Users on the left side of your dashboard. Now on the right click '+Invite User' on the next screen. 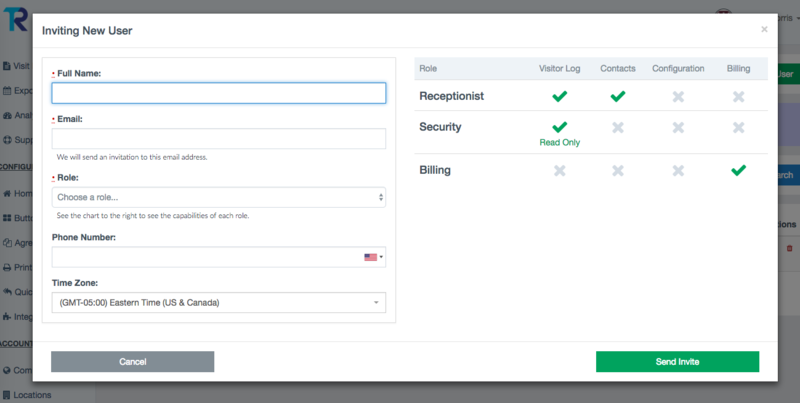 Now you can add the full name, email, etc... of the user you will invite to access your Receptionist account. Be sure to add a 'role' for that user. To the right you will see the level of access that each role allows. Invited users will need to accept the invitation sent via email in order to access your account. There is no limit to the number of users or additional cost included when adding users to your account.